Concerts, sportevents, shows, festivals, hotels vouchers, alltickets - Your Ticket. Your Event. Bonez Mc & Raf Camora show tickets for the current tour are available at alltickets and can now be ordered in the webshop. For the Bonez Mc & Raf Camora show we try to get you all ticket price ranges, from standing room, cheaper seats to top seats via the secondary market. The prices are determined by third parties and may be lower or higher than the price printed on them. 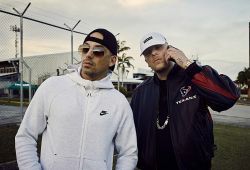 If no tickets are available, you can register for the TicketAlarm of the Bonez Mc & Raf Camora# show at any time.